← Ann M. Krause-Hanson, Ph.D.
HANOVER, PA, September 15, 2015, Ann Tolley Shorb, Ph.D., Founder, Director and Counselor with Christian Counseling & Educational Services, has been recognized by Elite American Educators for dedication, achievements, and leadership in Christian counseling services. A sophisticated background in Bible education and counseling allows Dr. Shorb to thrive professionally at the helm of the Christian counseling and education center that she founded. She provides family and marriage counseling services, manages five counselors, leads educational seminars, and teaches Bible study sessions. Dr. Shorb also uses puppetry and ventriloquism in her teachings and the counseling ministry, speaks publicly at local events, and facilitates community outreach initiatives. Dr. Shorb stands out because of her engaging sense of humor and the uniqueness of her practice. She approaches her practice and care for clients through mind, body and spirit. She became involved in her profession through her experience working in the women’s ministry of her local church. She followed her dreams of helping others through Christian leadership services, and has been able to support the goals and visions of those in her community by leading educational seminars and offering guidance and direction to those who feel they may need it. Dr. Shorb hopes to make a lasting impression on the people whose lives she touches, and to serve as a role model by always demonstrating honesty and integrity. Dr. Shorb was originally selected for inclusion in EliteAMERICAN Educators in 2013. 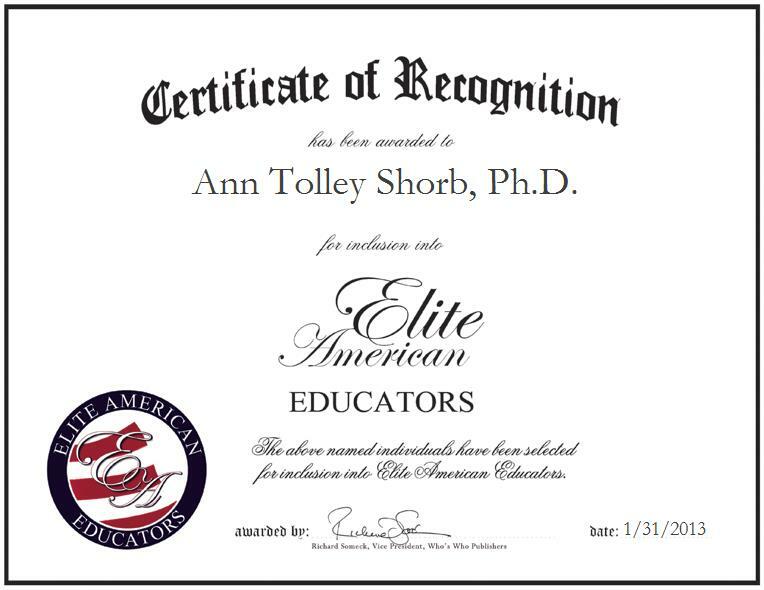 We are proud to be featuring Dr. Shorb again in EliteAMERICAN Educators for 2015. Contact Ann Tolley Shorb, Ph.D. This entry was posted in Religious Education and tagged bible education, bible study, christian counseling, community outreach, consulting, education center, marriage counseling, ministry, public speaking. Bookmark the permalink.